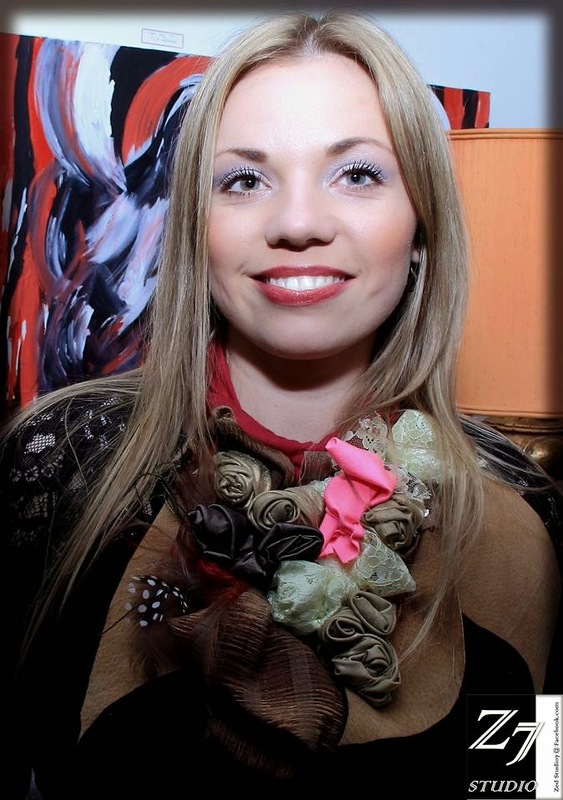 Behind the Scenes Q & A with Monika Blichar - Founder of Art World Expo and MAB Ventures! I met friend, artist, entrepreneur extraordinaire - Monika Blichar - in 2009 when I had just printed the first annual collectible edition of my magazine. She was running one of her very first art events at The Vancouver Aquarium. Over the last 4 years my respect and admiration for her vision, work ethic, focus, vision and true generosity has only grown. She embraces the same concept I do of Ujamaa - a belief in cooperative economics or as I loosely translate - "My success is dependent on your success, we build our wealth together." There is also an emphasis on giving back. From free summer art camps for underprivileged children, to her work helping educate and motivate others to find financial success doing what they love, she continues to touch lives and build a sense of community. As the 4th edition of Art World Expo fast approaches on May 2nd, I wanted to give each of you an opportunity to hear about her journey to this moment. Welcome to this behind the scenes Q & A with my dear friend - Monika Blichar. 1. You are first and foremost an artist. Can you share an interesting story from your childhood or teen years? My family immigrated to Canada when I was a baby from Poland. My parents wanted us to do a lot of different things that they didn't get to do, so my after school activities were always full of music, karate, painting and of course, homework! I remember really liking all the different things we were able to but also remember that it was a struggle for my family being in a new country with no relatives in close proximity. From a young age, we were taught the value of being in Canada and working to be the best we could be. We were taught Polish at home, French at school and English on the playground. As the oldest, I also helped translate for my parent's business or in the community, worked my first job at age 13 and always wanted to get the best grades to bring home to my parents who always wanted to see A's. Doing so many things as a child really prepped me for working in the arts business where you have to wear many hats to succeed! 2. When did you decide that a career in the arts would be your future? What journey did you take after high school to achieve this goal? I always knew that I wanted to do something 'artsy'. Recently, I went through old journals and drawings from when I was in primary school; singer, artist, movie star. All things in the arts from a young age. In high school, I drew and painted a lot but went on to complete a Bachelor's of Arts with an English Major and French Minor followed by the BC College ofTeacher's Post Degree Program. It wasn't until after starting to teach in public and private schools that I felt really compelled to pursue creativity and imagination as a career and business. I remember starting out and feeling overwhelmed by all the possibilities. Even though I dream big, I am actually pretty practical when it comes to working step by step to achieve my goals. I knew I had to start somewhere, so I started making more time to paint, to write, to see and participate in shows. 3. Before you stepped into art and entrepreneurship full-time, I know you spent time working as a teacher. Can you share something about that experience? I taught languages in schools, primarily French. There is always a lot of work for language teachers in British Columbia and I think the best part of working as a teacher is that you are able to share information and hopefully pass it along in a memorable way so that students are engaged and remember that learning of all sorts can be fun and worthwhile not just in school, but also in life. For young people, adolescence can be hard and I found it important to work extra hard with those who were the least advantaged; the underdog. I have worked in public and private schools as well as with at risk youth and am drawn to the underdog time and time again. I think it's really important to look out for youth whose backgrounds are difficult likely because I connect to that kid who didn't have much growing up or whose family was disadvantaged by being first generation immigrants with little support. In recent years, we started a foundation and have fundraised for kids art camps which has enabled us to offer kids throughout the Lower Mainland a fun filled week at a nominal cost. We have received lots of support from the community and we always have fun teaching in the studio. 4. Can you share a little about the decision to move from teacher to promoter of local artists running events? Shortly before I took my first teaching job, my high school boyfriend passed away tragically in a car accident. A year or so later, I started working at my first full time job at a private school and lost my mother to ovarian cancer. A short time later, my only aunt in Canada also passed away from cancer. I remember feeling the urgency from the losses of all those important and special people in my life to do something that I loved and not sacrifice my precious time here in places where I didn't feel appreciated, fulfilled, challenged or passionate. By the end of my 26th year, I had embarked on the road to pursuing dreams and wasn't going to take anything less from myself or those around me. In creating art and poetry, I found the most peace while feeling heartbroken and alone. I painted for hours on end, wrote in a journal religiously and read tons. What I found was that the more I painted, wrote, read and sought inspiration and meaning, the more I felt fulfilled. I participated in several shows in the area, but found that I wanted to do more and I believed that I had many skills from both my academic training and also my life experiences to put together my own projects. Right, some of Monika's art work custom printed on a pillow, a backpack and a shopping bag. Even when starting small as a freelance artist and coordinator of small programs and events, I started meeting amazing people with stories and backgrounds that made me feel part of something special and something whole again. All these connections put me back together again with their stories, their creativity and their belief in my being able to facilitate something wonderful for them and the community, I really started to grow both personally and professionally. Art is what allowed me to flourish inside and out by featuring and connecting people to one another through this abundance of talent, imagination, and beauty. It was only a natural progression to keep growing into this role and seeing what other opportunities would present themselves because it was in this role where I felt the most at ease and the most happiness. It was giving me wonderful gifts of new friendships, creativity from all sorts of artists and entrepreneurs, and above all else, it was giving me the freedom to work with people who were just as passionate about dreams as I was. One of the best people I met was you Marilyn who has really been there for me all along! Thank you! 5. Art World Expo - now coming up on its 4th anniversary - is definitely one of your largest and most high profile events. What lead you to found this amazing exposition of art, fashion, body painting and more? What is it you want to accomplish? Art World Expo is a massive project that has grown into what it is today through dedicated people, motivated artists and support from the community. The beginnings of the event were amazing as our first show we had coordinated 65 artist exhibitors, a body painting competition and guest speakers to raise awareness for Safe Water Nexus after the earthquake in Haiti. The first show was a huge success in terms of awareness for the charity and for the artists and so, I decided to brand the Art World Expo and start putting the event together annually to encourage the community to participate more frequently in the arts through many unique art forms including art, fashion, body painting and music. It's always amazing to see the local, national and international community growing each year and at the same time, I feel humbled to work with such talented people each year. My vision for AWE is big! I am working on expanding the show into another major city and also working with new partners to introduce Art World Expo onto the international stage in a variety of new mediums. My goal is to help as many artists and creative individuals showcase their work as well as connect the general public to the art world in general. Certainly, my personal experience with art fuels this desire, but I also firmly believe that through arts and culture, we create hope, motivation and fuel passion through showcasing possibility, imagination and dreams. 6. What are some of your favourite memories from the last 3 events? By far, my favorite thing from each event is all the people that I am able to work with. Each year, the show brings artists from around the world and it is always a real treat for me to learn about each artist in the show. Some of my favorite exhibitions, performances and affiliations have included a 15ft high installation from Eric Larsen, strolling models from Paintertainment, Bif Naked's 2012 performance, working with Fresh Magazine, and being lucky enough to book local celebrities and media partners annually. I work closely with all my exhibitors and each year, when we open the doors and I see a flood of people coming through to see, experience or purchase work, my heart flutters for them. Having put so much effort into the event coordination, promotions and partnerships with sponsors, affiliates and volunteers, I usually end up tearing up just seeing the enthusiasm from everyone in attendance. It makes me so happy to see the support for creative talent, but by far the best thing is to be able to work with the people behind the scenes in creating the event for the artists. 7. Tell us something about ArtWorld Expo 2014? What exciting things await us this year? The theme for the 2014 installment is "Circus" which my sister and I thought of last year after the event. Every year, we offer a theme to the body painters to work with and also put that theme out as the central inspiration for the show. Guests are encouraged to dress to suit the theme, this year we hope to see lots of top hats, clown or mime make up or steam punk outfits. As usual, we will have exhibitors of all sorts fill the venue offering guests the chance to see and purchase rare work and see a number of performances and shows. We will have a live special effects make up demonstration from New Image College of Fine Arts, a fashion show from Hive Mind Millinery, and Fiona Forbes from The RUSH will be hosting the body painting competition closer to the end of the evening. We will also have some surprise entertainers gracing the stage as well as a first Art World Expo Food Lounge featuring local restaurants. The show also has a silent auction featuring hundreds of pieces of art, products and services donated to supporting Make andBreak Arts Foundation whose main goals is to support arts in Vancouver via exhibitions, programs and events. There will also be raffles, a Circus themed photo booth by Kyle Rurak Photography, tons of contests and live art demonstrations by exhibitors including a live carving demonstration by Tim Motchman from Sointula, BC. And of course, we will have swag bags for everyone who walks through the doors! 8. As this is just one of the many business interests you are involved with, please share a little about your other projects. I have a lot of interests and as the Expo has grown, so have my business and charitable projects. Our other major projects and programs include Diamond Dolls Women's Networking Group, MAB Art Studio & Boutique Gallery, The FAB ArtProgram and also Make and Break Arts Foundation. In working with many of the artists, I found that there was a lot of need for business development for myself and for creative entrepreneurs in all sorts of areas. The Diamond Dolls Women's Networking Group allows me to work with women in all sorts of businesses through ongoing meetings featuring guest speakers and highlighting business development through business training. The relationships that we make there are so valuable in terms of business growth, cross promotions and affiliations that it only made sense for me to start this group two years ago. A bonus is that some of my best friends and mentors have come from this group of women! MAB Art Studio & Boutique Gallery was recently opened due to the need for a place where artists could meet and where the public could enjoy creative education as well as enjoying locally made art, fashion and accessories. We are open 6 days a week and offer art classes, kids camps, venue rentals, and host meetings and events at our North Shore location. Although I have another studio, this particular studio has been an integral part of my business model since opening last year and has allowed me to expand my reach certainly locally but also host a place for creative or interested people to congregate at meetings, classes, workshops or events. Furthermore, I started THE FAB ArtProgram where artists on the West Coast are able to display work in host venues on rotation which we coordinate with business owners. The artists in the group have come from Vancouver, Victoria, SaltspringIsland, Courtenay, and Seattle. We coordinate, promote and sell the work for these artists in an array of venues including boutiques, cafes, colleges, restaurants and even car dealerships! This program allows artists to show and sell work with the support from our team and the relationships that we have built in our community. We also help these artists with social media training, online promotions, Internet marketing and coordinate an annual themed show where each artist is assigned a project to work on but also learns about exhibition coordination and marketing. It's a really excellent program for artists who would like to learn more about the business side of being an artist while working with other creative professionals. In closing I asked Blichar to share her thoughts - to sum up the wisdom gained during her journey to this point and time. This was her response. "What I've learned in the past four years running this business and following my dreams, is that anything is possible if you put your mind to it and really work on surrounding yourself with like minded, positive and motivated people. All the success I have had to date has manifested because I have never given up on my vision, but also because of being able to work with others and help others grow in addition to growing my own company. When we work together as a group, we celebrate success together. It's very much like a family for me, I want every member of my family to succeed, be happy and thrive." For more information on Blichar, Art World Expo 2014, Diamond Dolls, Art camps, studio rental, corporate workshops and more, go to www.monikablichar.com. To purchase tickets to Art World Expo (at early bird rates until April 18th) click HERE.